Monsignor Thomas G. Bohlin, U.S. vicar of Opus Dei, is a guest panelist writer for the Washington Post blog called “On Faith.” Unfortunately you can’t subscribe to just his contributions. However, you can bookmark the link and check it regularly. Here’s some great news. On May 23rd in Rome, Bishop Javier Echevarría ordained thirty new priests for the Prelature of Opus Dei. On the Opus Dei website you can find a lot of pictures from the ordination as well as video and video testimonials from some of the new priests. I just came across this link that shows Opus Dei locations around the world via Google Maps. There are several pages of links that provide address and contact information. Mission & Characteristics: Saint JosemarÃ­a EscrivÃ¡ founded Opus Dei in 1928 to help people live by the Gospel in their daily activities and make Christ present in every endeavor. Opus Dei focuses on work and daily life as an occasion for spiritual growth and an opportunity to contribute to a better world. Opus Dei also emphasizes divine filiation, unity of life, prayer and sacrifice, charity, apostolate and fidelity to the Pope. Activities: The chief activity of Opus Dei members is personal effort to grow in holiness, carry out apostolate and improve society. In support of these efforts, Opus Dei provides spiritual direction, prayer and study meetings, retreats, classes and workshops. 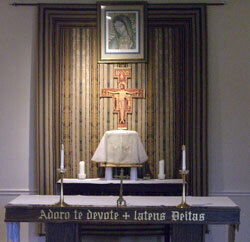 These activities take place in an Opus Dei center, or in a church, office or private home. Members also sometimes join with non-members to organize educational, charitable, and cultural projects, which may include spiritual formation carried out by Opus Dei. One of the most prayerful and dedicated priests in our diocese celebrated 25 years of priestly service this Sunday. He is associated with the work of Opus Dei and at his Jubilee Mass he openly acknowledged the important role Opus Dei plays in his religious formation. Among those in attendance at Fr. 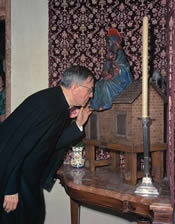 Korte’s Jubilee celebration were Bishop Robert Finn (Kansas City/St. Joseph, MO) who is a member of the Priestly Society of the Holy Cross, the organization for diocesan priest “associates”of Opus Dei, and Fr. 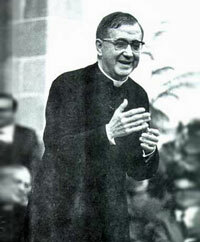 Jay Alvarez, a priest of the Prelature of Opus Dei. I’m all for the intellectual life and solid doctrine, but we also need prayer and solid piety with that. When you get out and into the parishes, you find that a lot of your strength is spent dealing with intense pastoral and spiritual issues. And you need to have a way to recover your strength. As a priest, you can get caught up in a kind of activism. So you don’t want to neglect your prayer life. You need a way to re-energize between pastoral activities…. Indeed we should always pray for all of our priests – and the Pope! According to the National Catholic Reporter Bishop Finn is one of four “Opus Dei Bishops” in the U.S. The others include Archbishop Jose Gomez of San Antonio, Bishop Nicholas DiMarzio of Brooklyn and Archbishop John Myers of Newark, N.J.
It’s still Christmas even though it seems like most people have forgotten about it and are moving on to how to celebrate New Year’s and the Super Bowl. The definition of Christmas Season seems to vary as you’ll find in this article on Wikipedia. You can find more Catholic information at American Catholic. Better yet, here’s a great article about the Christmas season from the Opus Dei website. 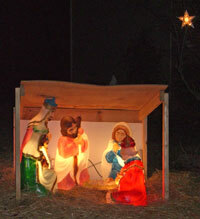 I added the wise men to our front yard manger yesterday. I know it’s not Epiphany yet but at least some of my neighbors understand. I hope everyone who visits has had a nice Christmas. Our family has even if we’re starting to become more spread out as our daughters get older and have other interests and friends since they’ve been in college. Here’s wishing you a very safe and happy New Year. 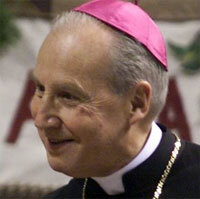 The Prelate of Opus Dei, Bishop Javier EchevarrÃ­a, has written a letter to the faithful which you can find online. In it he urges the faithful to consider the ordinary but exemplary life of the first Christians. 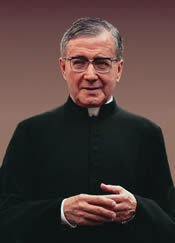 To explain Opus Deiâ€™s mission, St. JosemarÃ­a often turned to those first sisters and brothers of ours in the faith. If you want a point of comparison, he would say, the easiest way to understand Opus Dei is to consider the life of the early Christians. They lived their Christian vocation seriously, seeking earnestly the holiness to which they had been called by their Baptism. Externally they did nothing to distinguish themselves from their fellow citizens. Similarly, he added, the faithful of Opus Dei are ordinary people. They work like everyone else and live in the midst of the world just as they did before they joined. There is nothing false or artificial about their behavior. They live like any other Christian citizen who wants to respond fully to the demands of his faith, because that is what they are.